If you pick up a nutrition-related magazine somewhere within its pages you will find something written about superfoods. How to introduce them in your daily diet, the reasons why you should it, together with all relevant nutritional data. But what makes a food “super”? In order for a food to be characterised as superfood it needs to have an incredible array of health benefits that go well beyond just their nutritional value. The lists of such foods sometimes contain up to 50 different kind of fruits, vegetables and fish we should eat regularly. There is one fruit, however, that most of these lists often leave out. A leathery red- pink ball with jewel-like ruby seeds, the pomegranate. The last decade, scientists saw through the glossy seeds and started to gradually discover and present pomegranate’s superpowers. As research is still going strong, data that emerge demonstrate the many health and beauty benefits of pomegranate and rightfully places it amongst other “food heroes”, like berries, salmon or broccoli. The pomegranate, or Punica granatum as is its botanical name, is one of the world’s most ancient fruits. Its history can be traced in historical documents as far back as 4000 B.C when scouts brought some to Moses to show that the land of Israel was fertile. Its virtue has been mentioned in many ancient texts. Greek mythology mentions it often. The most famous story is that of Persephone who has been kidnapped by Hades, the king of underworld. There the fruit is referred to as a symbol of fertility and bounty. Homer mentions it in Odyssey as part of the gardens of Alcinous, Shakespeare also mentions in Romeo & Juliet. And, in the Quran, it is called the fruit of paradise. Due to its frequent mentioning throughout the Old Testament of the Bible, many came to believe that it was pomegranate the forbidden fruit in the Garden of Eden and not the apple. Let’s explore this fruit’s benefits to see for yourself why it should become an integral part of your daily eating habits. [/quote_box_right]Pomegranates have a very high nutritional value. They are extra-loaded in vitamin C, B5 and potassium; 100 gr of seeds give you, on average, 16-17% of your daily requirement for vitamin C, 6% of potassium and 5% of B5. They are also filled with vitamin K, calcium, phosphorus and manganese, as they are, also, a great vegan source of iron and fibre. They contain only traces of fat and are cholesterol free. Their most special characteristic, yet, is that they are nature’s richest source of free-radical eliminating antioxidants. Their seeds have more antioxidant power than cranberry juice or green tea. The easiest way to introduce them to your daily diet is by mixing them in a salad. It will add color and a boost of extra nutrients. If you want something more special, make a nice glaze to go with your turkey fillets. For those with a sweet tooth, you can make pomegranate sorbet. 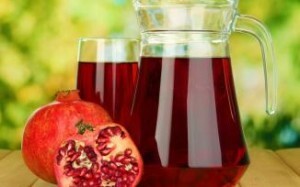 And if you prefer to drink it, either make the juice yourself or buy pure pomegranate juice with no additives and sugar. You will still get plenty of the fruit’s benefits. The Journal of Agricultural and Food Chemistry ranked the juice of pomegranates the healthiest of all fruit juices leaving behind concord grape juice (and red wine), blueberry and cranberry juice and tea.